"Thanks for all the help last year. My 6th grade girls team went undefeated in league play and won the league championship last year. I attribute much of the team's success to concepts taught straight from Coaches Clipboard." - Coach L.G. "Coach Gels, I would like to start out by saying coachesclipboard.net is the best basketball reference I have ever found on the net." - Coach J.S. "I have enjoyed your site for the past 2 1/2 years now and have built and improved my coaching philosophy on many of the concepts, drills, and advice given - keep up the good work!" - Coach T.G. "Wow! This is great, it is definitely a deal. I really appreciate this." - Coach A.Q. "Just wanted to let you know how successful your play called Slip has been with a 7th grade school team I coached last year." - Coach J.F. "Thanks for putting together such a fantastic resource and making it available on the web. I run a little high school on a small island in the western Pacific. The Coach's Clipboard lets all of us tap into your many years of experience and knowledge. The Coach's Clipboard is exactly what we've been looking for: a comprehensive playbook with a great philosophy covering all aspects of youth basketball in a very readable and easy to use format. You are providing a wonderful service and we are very grateful." - Fr. J.C.
"Thanks for your great web site! I have been coaching a YMCA team of 12-13 yr olds for the last month and it has become my first and last stop for idea's." - Coach G.D.
"I just wanted to say thanks for having your web site, it is a revelation and an excellent resource. I have just started coaching a bunch of great 11 year old boys... your site has been a bit of a savior." - Coach F.
"Coach Gels thank you very much for your quick response to my questions." - C.Z. "Your website has been the BEST resource for learning how to coach. What a great resource! I have applied your info and made my own variations that work great for my son's 5th Grade All Net team." - Coach G.C. "Fantastic basketball information! Your teaching on fundamentals has made me a far better basketball coach. I have used and modified many of your plays with our team and I especially find your information on breaking down zones very helpful." - Coach G.B. "I recently purchased your Basketball CD (USB drive) and I have enjoyed every moment in review. I must say your program is the best organized and fundamentally sound for a new or experienced coach." - Coach E.E. "I have been visiting your web site for 2 years now and I think it is the best of its kind. I coach 3 thru 6 grade boys and girls but I have been able to develop a good program and I credit a lot of my success to your web page." - J.R.
"Dr. Jim- I really love your site and everyone I share it with is very, very impressed." - Coach C.M. 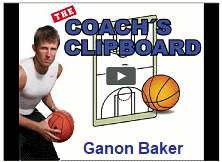 "I am impressed with the breadth of information in your Coach's Clipboard product. I purchased a few copies of your player's CDs (USBs) for my varsity team a few years back. It was very helpful in teaching the drills and skills we worked on in practice." - Coach C.P. "Your website is by far the best website on the internet in its field! I am a public middle school coach and have gotten many plays and drills, including man and zone offense from your site!" - M.M. "I am a part of an organization that runs a summer camp for kids with ADHD. One of the ways in which we work with kids is through sports and we really like the drills that you have on your website." - J.O. "James, I want to thank you for your website and all the great content you offer. Being relatively new to coaching basketball, I really leaned on your website to help with my preparation, team drills, technique and plays for the team. I inherited a team that went 3-13 last year. With help from your website, we finished the year 17-3 and won the regional championship! Thank you for your help this year." - Coach D.A. "I subscribe to the coaches clipboard and I'm letting you know I love it. It's a very valuable tool that has helped me tremendously. Good work Mr. Gels" - E.M.